Progress! I had originally planned to piece the quilt backing for my husband’s Love Letters quilt top last Wednesday, but apparently the universe had other plans for me. I got sucked into the vortex of the #MiniMiniQuiltSwap through Instagram instead. It has been fun, but I really am excited to finish this quilt for my patient (!) and loving husband. I took the time at the beginning of this week to play with the extra blocks and scraps. I quickly decided to make a few extra Love Letters blocks, and I am really happy with how the pieced backing pulled together. The strips for the binding are set aside, and the quilt is loaded onto my long arm. I discussed the quilting with my husband, and we picked out 50wt Aurifil 2620, stainless steel, for the thread. For the quilting pattern, it is going to be an all over back and forth line with personal details mixed in (like the states we have lived in together and other little love notes). I am excited to get started on the quilting now that I have a plan! I also want to remind everyone that today is the last day of the Jaftex 85th anniversary blog hop that has been underway for the month of September. There are a lot of fabric bundles and awesome grand prizes available in giveaways, so be sure to check out the projects and blog posts below for more details on how to enter. 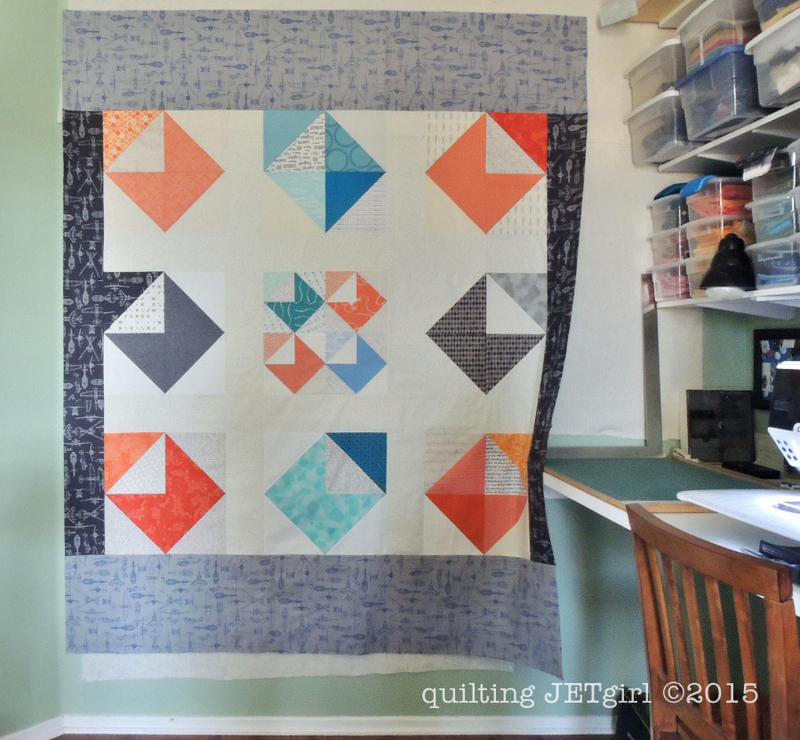 September 15 – Yvonne @ Quilting Jetgirl <== That’s me!! September 29 – Jenny @ Martingale& Co. The backing is awesome! Truly a reversible quilt 😀 Cannot wait to see it all quilted up! I love the back. You can make it a reversible quilt. Good luck with the quilting. I love the back! How neat to use both sizes of the envelopes–creative!!! Will you write love notes to your husband in your quilting? The back looks as good as the front, I can’t wait to see it all finished!!! I am seeing love letters quilts everywhere, and have fallen in “love” myself! Yours is beautiful…such fresh, pretty colours! Your love letters backing is beautiful! Hmmm… I was making great progress working on a quilt of mine too, when it might appear that the same sweet person distracted me, or as you put it… sucked me into the vortex. Good luck getting back on track! I love pieced backs and the idea to personalize the quilting is one of the great ones. Looking forward to see the finished quilt. Love this quilt! Great colors and fun design. Awesome backing. Love the differences in size and angle. I want to use this block to make a tote bag sometimes. It would be a great reminder to get the mail. The back of this quilt is really beautiful Yvonne. Looking forward to the finish. I wondered if you were going to make the back into on giant love letter, but this is much better! It’s perfect. Silly universe distracting you from love letters. I think adding the special touches in the quilting will make an even more personal gift more endearing. What a lovely quilt you have going here. Love your ideas for the quilting and looking forward to seeing the result! That sounds like a great quilting plan! Such a fun way to really personalize a quilt for someone special. I love two sided quilts! Do you find that the plan for the back comes together more quickly than the front? I always feel like making the back is a more carefree process and sometimes after working long and hard on the front, I end up liking the back more. Maybe it’s a bit more improvisational? Your quilting plan sounds so neat–I’m looking forward to seeing your little love notes quilted in. You really did get sucked into the vortex! Every time I open my IG feed, there’s a new mini mini by you…hehe. I really like the colours on this one! The back now has so much lovely detail that I am sure it counts as reversible, right?